Code Review Checklist: Stop Producing Bugs Now! In this blog post, aimed at CTO’s and software development professionals, we look at what you can do to reduce the number of bugs in your software products. I‘ve been a developer, both contract and permanent, long enough that I wish I could utter a magic phrase and end development bugs forever. It‘s not that easy, unfortunately; it‘s not rocket science either. If you had asked me about how to reduce bugs back when I first started programming I‘d have thrown my arms up in the air in exasperation at the impossible task you‘ve just asked me to achieve. Move on a few years (ok, maybe almost a few decades), we have built in real source control integration that isn‘t visual source safe (probably the worst source control system ever); automated unit, integration, and user interface testing; code analysis; the list goes on. There are lots of free, open source, and commercially licensed tools – the choice is yours. A word to the wise though, you can spend an absolute fortune on the latest tools but if your practices and processes don‘t hold up all you‘ll achieve is headaches! So how do you make sure your practices and processes hold up against scrutiny? You review code. A code review is a must for any project if you want it to succeed. Imagine the code we are reviewing is a piece of paper – and a potential bug/issue or misinterpretation is a grain of sand. Would it be easier to find that grain of sand on a postcard-sized piece of paper or on a piece of paper the size of a house? As a reviewer, you need to be objective about the code you are reviewing – if you are struggling to keep track of where you are then you can‘t devote your full attention to the review. Why is this important? We all like to think that we are intelligent, and able to multitask – after all, we program computers for a living. Studies have proven people are inherently bad at multitasking. Every time you switch to a new task you decrease your productivity, both the cognitive load of learning the new task, as well as the inability to fully let go of the previous task, occupy your thoughts. Keeping your submission and review focused on a single purpose helps maintain focus on the task at hand – checking the code does what it is meant to do. Remember that piece of paper with the grain of sand on it I just talked about? What would happen if instead of one piece of paper we scaled that up so you had to review 50 pieces to find that one grain of sand? Finding that grain of sand (the bug) would be orders of magnitudes harder. Scale is another important aspect of both the submission and the review. Make sure only the required objects are included in the review – you may well have to deal with 500 classes due to a major refactoring exercise or a drastic redesign – but often this can be broken down into more reasonable chunks. As a reviewer, it is your duty to ensure that the specific collection of objects you are being asked to review belong together. The cognitive load I discussed in the previous section gets worse as the complexity goes up! Separation of Concerns – each module or class should be responsible for a single part of functionality in the application. This DOES NOT mean you need one class for each function. The intention is to ensure that you don‘t have “god” objects – i.e. a single class that does absolutely everything and therefore more than likely quite sensitive to change. Ask yourself “are helper objects tightly coupled?”, “Do classes manipulate instances of another class?” if the answer is yes, there may be an issue here. Keep it simple, stupid! (KISS) – Keep the solution, its modules/classes and functions simple. Overly complex code is harder to debug and harder to ensure all branching logic can be tested sufficiently. Don‘t Repeat Yourself (DRY) – If you find yourself reading essentially the same code over and over, think about whether the code could be restructured so that the methods can be REUSED. Code reuse reduces complexity (normally) and helps in testability. Architecture – if the solution is an MVC solution does it adhere to those principles? Are there any deviations? If there are, why? The answer here isn‘t that a developer should be doggedly sticking to a given architecture – but rather that any deviation is thought out and reasoned. Most organizations have some sort of coding standard; whether this is informal or formal can depend on a whole gamut of factors. Normally though, the coding standard has evolved through time based on the changing fashions and tastes of the developers involved in building and maintaining the code. Why is a coding standard important? It allows all the developers involved in the process to work with a standard set of rules. If we all work on an even footing then we can ensure that the process of finding bugs is simpler. So what does a coding standard guide look like? Let‘s have a look at what Microsoft think should go into one. At its simplest, there should be some rules about how things should be named, and how code structures should be typed. Explicitly typed variables – use implied typing, this makes your code more flexible. In this case, imagine we change the Customer collection from List to List so that it can be used against individuals or organizations. You now need to refactor all your code, using var instead would mean you only need to refactor code that breaks (see Unit Tests). Consistent Naming – you can see mixed casing for the methods being called. shows As long as the methods in the relevant classes and objects are the named in the same way your code will compile but it adds visual clutter. It‘s now much clearer what is in the loop and what is outside the loop. Visually the code is more balanced and includes hints as to what is a method and what is a variable or property. Your inspection should include checking the reviewed code meets the standards you set in your organization but don‘t worry – you‘re not going to be a glorified formatting expert there are tools out there that can help! I‘ve used StyleCop for many years now, both in CI environments and those without. It comes in various guises, it can be integrated into Visual Studio if you want it to be; you can also integrate it with ReSharper and your Automated Builds if you want to. Great, so now we have clean and tidy code, that‘s split into simple, easy to understand chunks. Now what? Does the code even compile? If there are any errors in the compilation then something is wrong; the code is obviously broken. We are all different; we all have our own idiosyncrasies and preferences for tools, file locations, and structures. So it stands to reason what may compile on my machine might not compile on another developer‘s computer. Why though? Is it a missing reference? An environmental issue or dependency that doesn‘t exist? What would happen if a customer tried to run the code compiled in my development environment on their own device? This is why a clean, automated build environment is key. It helps remove the environmental factors; ensuring that all builds have all the components they require included in them. If the code doesn‘t compile, unless you are specifically reviewing the reason for the compilation error; fail the review there and then, continue with the rest of the review though as it makes no sense to give up and leave other potential issues lurking. Ok, so we got rid of the compile errors? What about warnings? Warnings are there for a reason, they hint at where a bug may be coded into your application in the future. Fix it or ignore it – that decision is up to you, and your coding standards – if you ignore it though at least ensure why you are ignoring it is documented somewhere and suppress the warnings. Personally, I feel suppressing warnings is a bad idea, but I would recommend code-based suppression of the warnings as that way its version controlled and not dependent on your specific development environment. Good luck, and remember not to sweep too many warnings under the rug! Testing – who needs it right? “I‘m a developer – I know how to write code, testing takes too much time and I‘ve got plenty more to get on with”. I‘ve been there; read the book; and got the t-shirt several times now. Let‘s assume we are all perfect coders and that our code doesn‘t contain any bugs. Does it actually do what was intended? How do we prove that? Unit testing would tell you that what you coded and how it behaves matches what the design says your code should do. You should be testing expected behavior and edge cases. If you‘ve written an age validation routine you should be testing the upper and lower bounds, median values as well as values that should never be allowed. This will ensure your code meets requirements and is robust enough to be used in production. If you can automate those tests even better – you can test more scenarios in less time that way and be sure that each and every time you make a change that you haven‘t broken your own or code that was written by a team member. Not all code needs unit tested – you only need to test the public faces of your code – public classes, methods, and properties. You don‘t need to worry about the private methods normally as there should be no code that exists unless it‘s in use (we will discuss this later). Your review should include checking to see that the unit testing is sufficiently rigorous – don‘t be afraid to point out where a unit test may be weak or could be extended by adding more scenarios. As a reviewer, you need to make sure that there are sufficient tests written to ensure the functionality of the code is tested in the usual use cases – unless it‘s a very simple algorithm there‘s no way that you could test every possible eventuality. So when reviewing set a sufficiently high bar for acceptance. 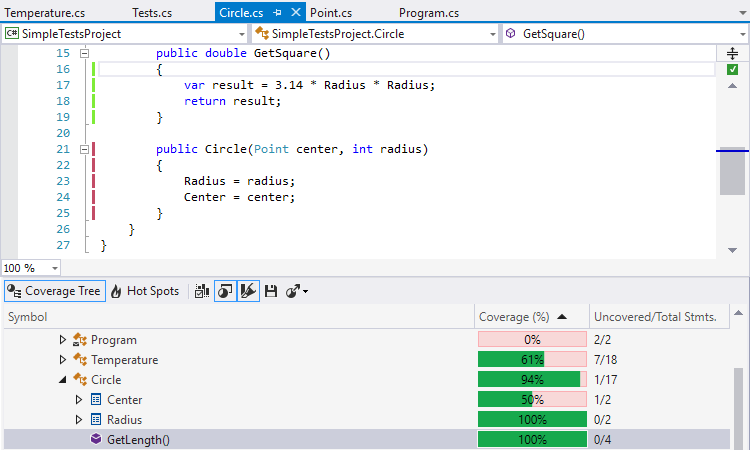 100% code coverage doesn‘t mean all possible paths/branches/states are tested. It just means each public method or class is tested at least once. While nothing is stopping you achieving 100% coverage – it is more important to ensure the Unit Tests themselves are rigorous enough to pass more than just the ideal scenario. This is why I rank checking code coverage lower than the unit tests themselves. 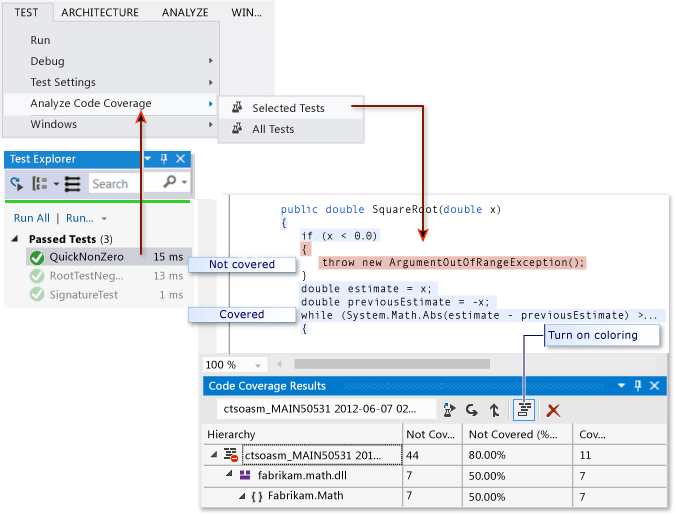 Personally, I prefer DotCover from JetBrains as part of the Resharper Ultimate package. With DotCover, you get an inline visualization of what is covered by a Unit Test and what isn‘t as well as an early indication of when a test is broken. You can find out how to use OpenCover here and ReportGenerator here – their use is a bit beyond the scope of this blog but if you‘re interested you could always suggest that as a topic for the future. Finally, a little aside to both the Reviewer and the Reviewed. A Code Review should not be a personal attack on one or the other; it shouldn‘t cause anger or animosity between team members. It is a tool, like many others that we use in our working lives, to assist in raising the standard of output from a good solution to a brilliant solution. That being said, there is also no harm in pointing out or appreciating good code solutions – I take pride in my solutions, especially when I feel they are elegant or simplify an otherwise complex problem. I think most developers do. The added benefit of a code review is that it presents a formalized opportunity to share knowledge – I can‘t tell you how many times in the past that I‘ve been handed a bug list, told to fix it all while having never seen the code or the requirements before. Your job will ultimately be made easier by having formalized code reviews. The process I‘ve discussed; using the tools, techniques, and measures helps build a fuller picture of what is required in a code review. Now that we have a better understanding it‘s a really simple process to put it all together into a checklist to help guide you through the next review you carry out. This isn‘t designed to be a comprehensive list but rather a starting point for you to customise so that it suits your team, projects, and organization. I‘ve highlighted some of the things I believe are key to a successful code review. It‘s not the only way to carry out a code review, there may be some things you want to add to or remove from your own checklist. The Important thing is to review code – review your own code, and review others. The fact you are reviewing it will make the code base better, as well as spread knowledge in the team. Let us know if you have implemented these or if you think I‘ve missed anything. Software development Code Reviews, Software Development, Source Control, Techniques, Visual Studio. permalink.